Sandbanks, famed for it’s stunning beaches, is known across the UK as one of the most affluent areas to live. As a result, it is no surprise that the Sandbanks peninsula boasts many impressive homes. Whether your home is a luxury apartment overlooking the sea, or a sprawling mansion located on the beach front, shutters are a perfect way to add a unique feel of grandeur to any interior. Just Shutters Sandbanks, part of the Just Shutters HQ region of Dorset, are experts in designing and installing luxury plantation shutters. Call the team on 01202 240769 to start your Just Shutters journey. 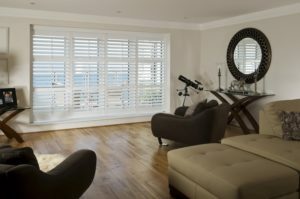 Just Shutters Sandbanks delivery unrivalled luxury. All shutters are made to measure and entirely bespoke to your requirements. As a result, your shutters will be truly unique – bring a sense of grandeur that is suited to your home. Fitting shutters in an irregular shaped window? No problem! Our experts understand that homes in Sandbanks are beautiful and can be architectural complex. Therefore, there is no window too challenging! See our stunning photo galleries to get inspired about shutters in your home! Contact Just Shutters Sandbanks on 01202 240769 today to start your Just Shutters journey. Whether you are booking your home design visit or want to ask a shutter related question, our dedicated team are on hand to help.